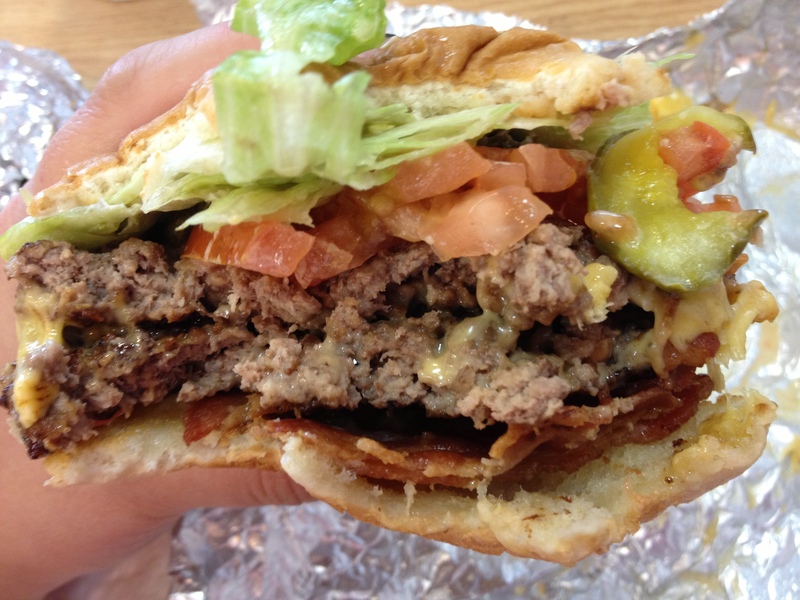 National Cheeseburger Day: Five Guys! | DidjaEat? ← Hello Fall: The Wawa Gobbler Is Back! 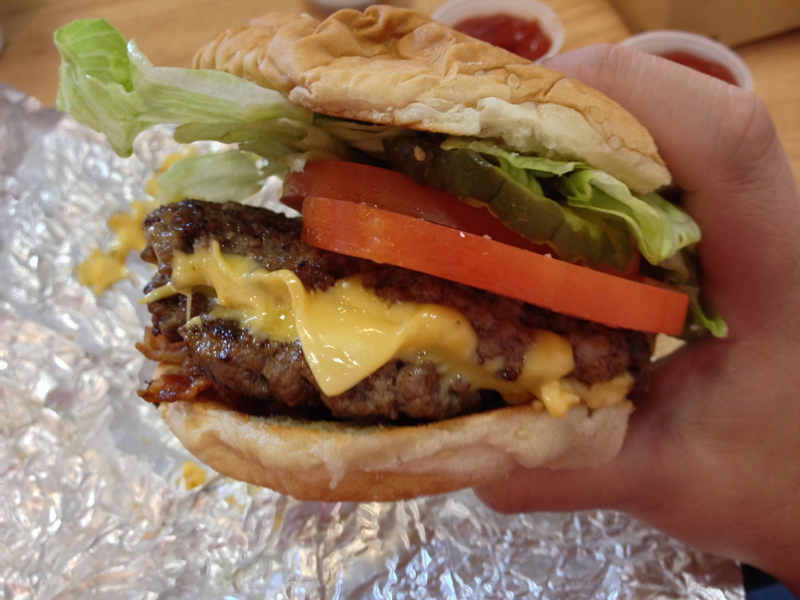 National Cheeseburger Day: Five Guys! Philadelphia, where I am from, live and love, is a town known for cheesesteaks (And soft pretzels and other stuff. But the media focuses on cheesesteaks. Whatever). So when you can look forward to something as awesome as a cheesesteak, nothing else really compares. Chicago has hotdogs (big deal) and New England has lobster rolls (a little pinchy) but none of that stuff has ever really taken hold here. So when burger places started popping up, I was intrigued. All we have ever really had was the run of the mill chain places, and frankly, I love a good burger. The good folks at PYT do an awesome job, Bobby’s Burger Palace is pretty great and even Shake Shack became a favorite for me. 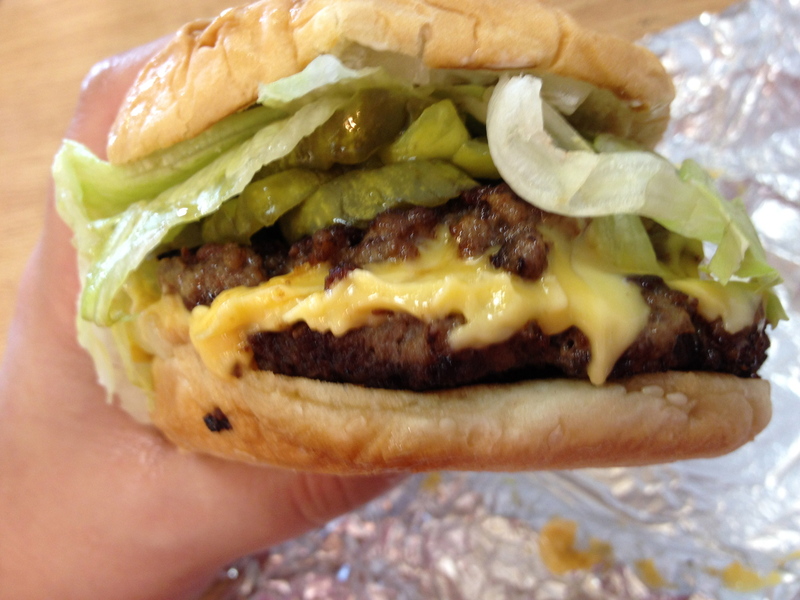 I even visited the Holy Grail of Hamburgers, In and Out Burger (nine thumbs up!). 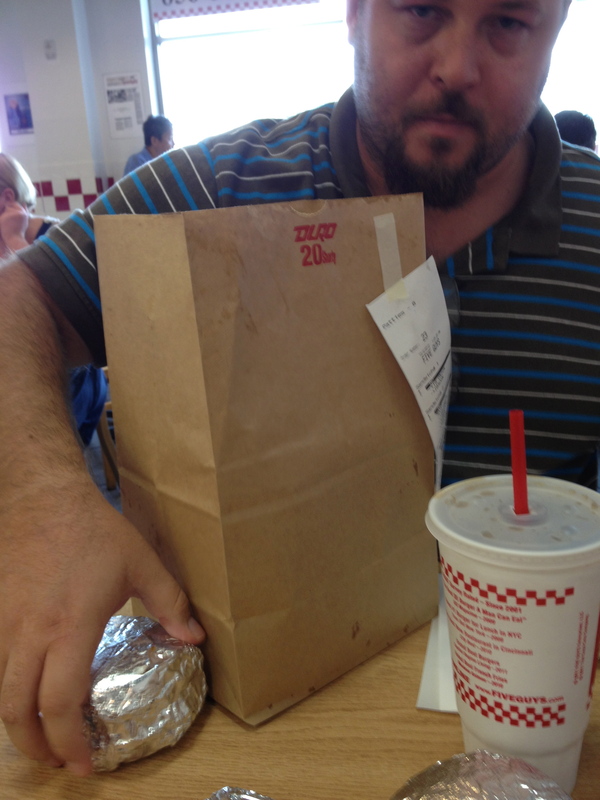 When people started telling me I HAD to go to Five Guys, I was a little skeptical. It looked, from the outside, kinda cheesy. They had giant 50 pound bags of potatoes stacked up with a sign telling you what farm and state they were from. They had boxes of peanuts for the people to munch on. But besides that, it was just a red and white place that was a little sparse. I had heard that you either liked it or hated it. I heard lots of things. I never got over there. On the last day at my old job, I ventured out with Brian and Jen to the Five Guys in Moorestown and, um, almost hurt myself. enough for all 3 of us. I, on the other hand, not knowing anything about the menu, ordered like an animal. 2 burgers: a cheeseburger and a bacon cheeseburger. We self served our beverages and had a seat. I was informed that the one order of fries would be enough and I figured they would have alot of fries. I’m not a huge fry fan so I shrugged it off…. then I saw the size of the order of fries. Brian said there was a lot of fries but yeah, I was not prepared. The amount of fries came to the second band of red checkers on that cup. Holy portion control, Batman. Seriously. Wow. And they do come right in the brown paper bag. Before you say “Ew!”, brown paper absorbs oil and grease so that your food stays hot but it doesn’t swim in the residual grease form the fryer and get soggy. In the South, when people make fried chicken, they pop the finished product on folded brown paper bags as well. It’s almost an unspoken industry secret. The fries themselves weren’t bad. They fry everything in Peanut Oil (and I am sure make a tidy profit selling the oil to a secondary market), so the fries aren’t exactly crunchy, but a little oily and chewy. Some people like fries like that and some, well, don’t. I am on the fence. I had a fistful of fries but I didn’t go back for too many. 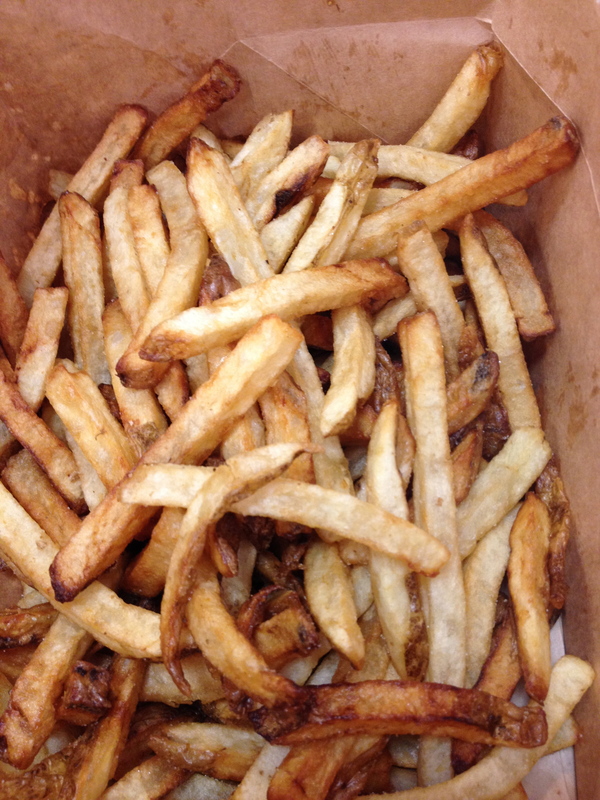 But kudos for Five Guys offering malt vinegar for the fries! That was a surprising touch and all three of us enjoyed it. The burgers on the other hand. Yeah, wow. First of all, here is a tip: if it doesn’t say “little” in front of it, it’s a double burger. I, like I had said, ordered 2 burgers and didn’t realize I’d be eating 2 double burgers. You see what I do for you people? This is what I do for journalism! And for my cardiologist (who apparently will be buying a new boat soon! Called “The DidjaEat?!”)! The burgers are wrapped in a simple aluminum foil wrap (with stickers to tell them apart). That saves them big overhead on custom printed wrap (So far they have saved on things to put fries in, recycling oil and now burger wrap. Pretty crafty.). Opening this thing up, you have to grin. It’s got handmade written all over it. When you order, there is a laundry list of toppings you can get (for free!). I got mayo, lettuce, tomato, and pickles. The pickles were thick, the tomatoes were thick cut and fresh and the iceberg lettuce was nice and crunchy. But I am sure you don’t care that much about the toppings, you care about the MEAT! First off, the bacon was not skimpy and it was not cheap, crappy bacon. It was delicious and you could taste that it hadn’t been cooked too far behind the burger. The burger itself Jen said was juicy and I agree wholeheartedly. It was juicy and delicious. There wasn’t a whole bunch of crap mixed in, no pink slime, no trimmings, no cow meat (just steer and heifer meat, so says the website). Even the cheese was perfect. Needless to say, there was very little conversation while we were chewing. The regular cheeseburger (the same as the bacon cheeseburger, but without the bacon and tomato) was pretty excellent as well. Jen and Brian gnawed on fries while I, again, complained about what I do for JOURNALISM! They nodded knowingly, with my Mom and Cardiologist on speed dial. They are good friends that way. If I would have had to reorder the food, I would not have had 2 double burgers, but frankly, that was my stupid fault for not checking it out before we got there. I did not have to eat for the rest of the day tho, so that’s something, right? So, let’s talk about price. I wouldn’t exactly say the Five Guys was cheap. If you wanted to get the same thing at McDonald’s, it would have been about 10 bucks cheaper (in Meal form). But then again, the meat isn’t nearly as delicious. For 4 Double burgers (with as many free toppings as you can stuff on there), the giant vat of fries that they almost had to wheel out on a hand truck and 3 large (all you can drink) sodas, it cost about 40 bucks. I probably wouldn’t eat there everyday (because I’d like to live to 40), but I have to say it was worth the money. Jen and Brian, who had been there before, really liked it too. I say, if you are looking for a quick lunch that is something a little different, hit them up! Fresh burgers, clean restaurant, and a small business instead of a giant conglomerate who puts god knows what in the burgers? If it’s not In and Out, the go Five Guys! Posted on October 8, 2012, in burgers, condiments, fast food, french fries, junk food, restaurants and tagged bacon cheeseburger, bacon cheeseburgers, condiments, double cheeseburgers, five guys burgers and fries, food, peanut oil, peanuts, potatoes, restaurants, toppings. Bookmark the permalink. Leave a comment.